A stethoscope is a diagnostic instrument used by medical professionals for auscultation, or listening to the internal sounds of an animal or human body. Stethoscope typically has a small disc-shaped resonator that is placed against the chest, and two tubes connected to earpieces. Doctors use these tools as part of a non-invasive examination procedure, commonly listening for sounds of congestion in the lungs, irregular heartbeats heart murmurs, and abnormal heart sounds. Nurses may also use them to listen for restored blood flow during blood pressure checks, among other procedures. Globally increasing ageing population, increasing spending on healthcare and innovations in the stethoscopes is expected to remain the key growth drivers during the period of study. Geographically, North America dominates the stethoscopes market driven by best in class infrastructure, increasing adoption of portable ultrasound systems and rapidly rising patient, best in industry practices and higher spending by the citizens towards healthcare expenditure. North America was followed by Europe and Asia-Pacific as the second and third largest market for stethoscopes market. Asia Pacific is projected to have the fastest growth, owing to rapidly developing medical infrastructure, increasing medical tourism, increased spending and increasing awareness amongst population in developing nations such as China and India in this region. This report identifies the global stethoscopes market size in for the year 2014-2016, and forecast of the same for year 2021. 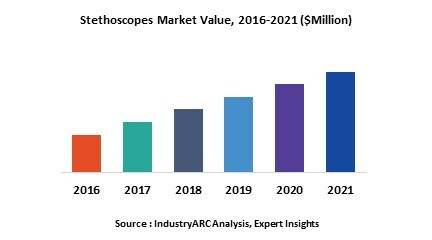 It also highlights the market drivers, restraints, growth indicators, challenges, and other key aspects with respect to global stethoscopes market. 9.6. GF Health Products Inc.